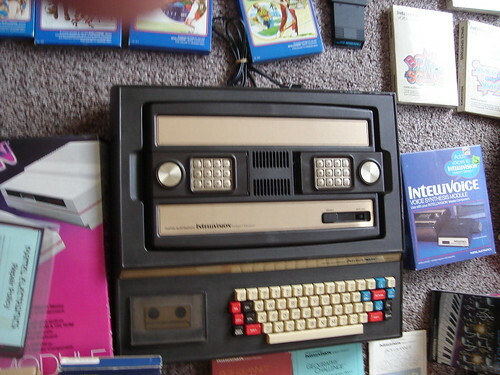 My name is Charles Ray and I came across your blog regarding the Original Intellivision Computer. I also was fortunate enough to find one at a flea market back in the 1980s for about $5. 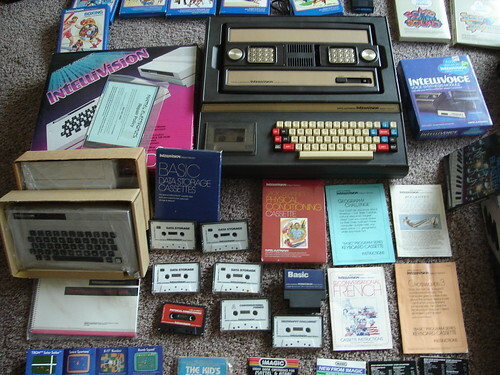 The tape drive is causing me problems and I took the computer to a intellivision expert. There is a shop in Anticoh California called the 4 Jays who is heavy into video games of all types. The guy who owned the shop stated he never saw one (the intellivision computer) before and did not even know where to begin to fix the tape drive. This coincides with your blog stating that the tape drive causes problems. I was also able to purchase the Basic Cartridge (this is needed for the computer to even run) I hear this is even rarer than the computer itself. I also purchased a unopened Jack LaLane, some opened software (another Jack Lalane, crossword, learning french etc but these did not have a box, just the cassettes and instructions). I also managed to get a couple of blank cassettes used for programming that sit in a Intellivison Box (the same type of box used for all the other intellivision games with the side opening cover. I would love to get the system back to working order but I don't know who could fix the tape drive? If I plug in the computer and put in the basic cartridge in the back the screen does light up the same as the pictures shown on your blog, so I know the computer still functions. Do you know of anyone who might be able to fix the tape drive? I have attached some pics. You might have to zoom in to see the accessories. I was also wondering how many of these systems are still out there? Lastly, I don't have the original box nor the instructions. Do you know of anyone who has the instructions? The software does have instructions. From the Charles Ray Mattel Intellivision Keyboard Component Collection. See the information above to see if you can help out with getting the tape drive working! 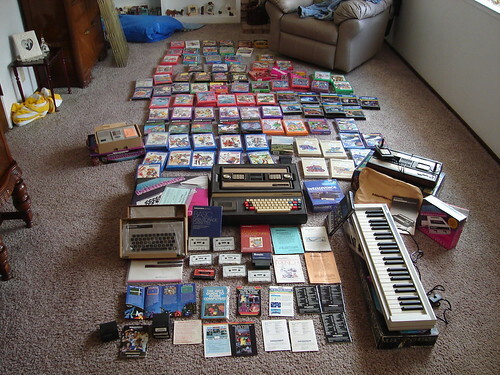 That is one gorgeous Intellivision collection! screen I suspect the tape drive mechanism just doesn't respond to the 'TAPE' command? This tape drive probably uses some sort of servo mechanism to control the tape as there are no play/pause/stop/ff/frw buttons. If you don't hear any clicking noises the servo mechanism is probably faulty. If you do hear clicking noises where the tapedeck head is clicked into position but the tape itself will not move then it could be something to do with slacking rubber drive bands/belts as most old tape drives often have rubber belts that tend to slack or even break causing the tapedrive to stop functioning. 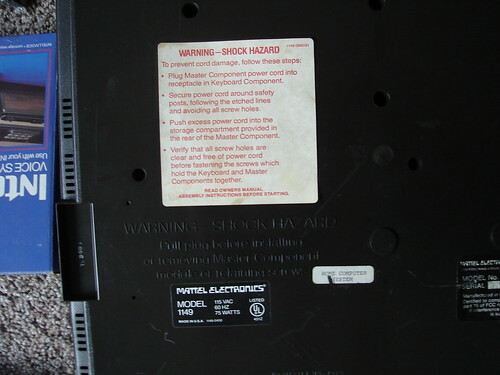 Perhaps this information on standard tape mechanisms helps although it is not related to this specific computer tape deck. I don't have any experience working with tape drives, but I was basically going to say something along the lines of what Mark said. My educated guess would be that any belts in the system are long gone. The MSX computer used a pulley-based belt system for its floppy drives. Those belts just disintegrate into oblivion over time and need to be replaced. In addition to replacement of the belt, the floppy needs a good cleaning. Those belt pieces could be anywhere, and they most likely left some residue around the wheels. If any belts or items are gone, it is possible that issuing commands to the drive will cause it to still make noise. That's a start. If that happens, maybe it is only a matter of replacing belts (assuming they are there & it isn't simply made up of gears). If no noise is made, it could be that a motor is burned out or the tape cannot be communicated with properly. I am totally guessing here. I would love to mess with it, but this would be for curiousity and experimentation moreso than applying experience to "just another tape drive repair." While I haven't serviced a cassette drive (aside from extracting old tapes from one), I can say that they have an awful lot of mechanical components in there. Not sure if you want to "experiment" with this one too much as it is tough to come by. If someone is to take that thing apart, they probably want to take good macro pictures as they move along in the process - both for historical documentation purposes (rare device!) as well as a reference for reassembly. In most tape based systems the pinch roller dies before the main drive belts have a chance to go. In some cases you can use a rubber 'reconditioner' to make it work in the short term. But it will never work out in the long term. Most people assurme that the real to real system drives the tape system, but it is the pinch roller that truly controlles the tapes passing speed on the head. If that slips or has nasty rubber reconditioners on it you will fail to read your data. This comes from PET level data cassette dealings. They used 2400 baud incoding then, the later CPU's used 4800 and that made it even more criticial. If your pinch roller fails the test your data will fail. I had a cassette that was read more than 1000 times, but the reading drive had to be cared for on a monthly basis. Basic head cleaning, mostly useless. And a roller cleaning, had to be done. But this is just crazy money.... you would have to have this money laying around doing nothing in order to be able to acquire something like this. Only folks I can imagine buying this would be a museum, archive, or an eccentric millionaire. Even a diehard fan of the system probably wouldn't be able to shell out that much all at once. The price seems too high to justify buying it with the intent of splitting it up and selling it piecemeal. That keyboard component is worth nearly $4000.00, less if not working... There were only 4000 made and they were test marketing releases as proof to the FCC that Mattel actually had the component. One sold on Ebay last year for $4000.00 and another is selling now with an unknown reserve and bids are already very high. And that's without a working tape drive, which is the most common ailment for these things.